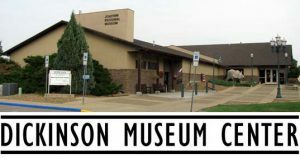 Located at 188 Museum Drive East in Dickinson North Dakota, the Dickinson Museum Center is open year round, except on Federal Public Holidays. Please check our Calendar for all upcoming closings. Admission covers entry to both the Badlands Dinosaur Museum and the Joachim Regional History Museum year round. Entry to the Pioneer Machinery Hall and a Guided Tour of Prairie Outpost Park buildings are also included with admission between Memorial Day and Labor Day only. Guided tours may be cancelled at any time. Groups of 10 or more may receive a discounted admission rate. School Groups MUST book ahead of time to receive our Educational rate. More information can be found here. Entrance to the buildings in Prairie Outpost Park are by guided tour ONLY. Guided Tours will be offered Daily from May 29th - September 2nd 2018 and are included with the price of Admission. Guided Tours may be cancelled at any time. 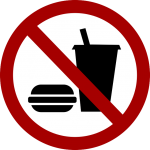 No Food, Drinks or Gum are allowed inside any Museum buildings. There are picnic tables located in Prairie Outpost Park. No Smoking is allowed on Museum Center grounds. 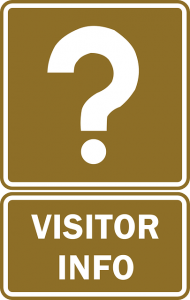 Provisions for visitors with disabilities include ramps, and accessible restroom facilities. Service animals are allowed in all public areas of the Dickinson Museum Center. A golf cart is available for individuals who need assistance on the tours of Prairie Outpost Park (ask a tour guide for more information). If additional services are necessary, please ask for assistance at the front desk. Some buildings have limited accessibility. 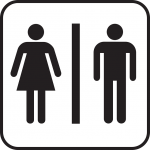 Public restrooms are available in the Badlands Dinosaur Museum, Joachim Museum, the Pioneer Machinery Building, and in Prairie Outpost Park (next to the Heritage Pavilion picnic shelter). All are accessible to visitors with disabilities.